THERE'S an obvious and growing similarity between the importance of Cillian O'Connor and Dean Rock to their teams. 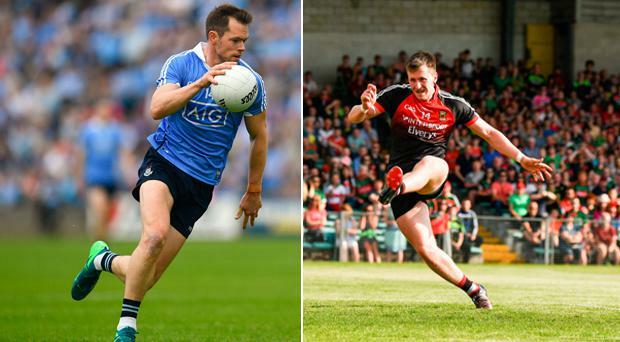 Last Saturday, O'Connor broke the all-time Mayo scoring record and at just 26, unbelievably, has the second highest tally of anyone in Championship history. Dean, meanwhile, is only three points away from overtaking no less a man than Charlie Redmond as the fifth highest Dublin scorer in League and Championship, despite the fact that he didn't even make his League debut until 2015. Both now have probably become their team's most important player. And they're quite similar in terms of their persona, going about their business without drawing too much attention. They don't celebrate goals – or at least not like Joe Brolly celebrated goals. You can go a whole match without really noticing them and then look at the match report and discover they'd scored seven or eight points. Neither has the pace of a Paul Mannion or the flair of a Conor McManus or the strength of a Damien Comer. So what they do doesn't always make The Sunday Game highlights. Dean, for instance, must have palmed more Championship goals now than anyone else in history? O'Connor has scored 23 Championship goals – almost one in every two games – but how many Goal of the Month contenders do you remember? And they're both clearly obsessive about their craft. On his profile on the Dublin county board website, Dean lists Jonny Wilkinson as his favourite sportsman and I'm sure if you asked Cillian O'Connor, he'd probably cite someone who was similarly obsessed with improving whatever skill it was they had to execute in their chosen game. I remember in 2011, when he was only 20 or 21 and just on the Dublin squad, Dean came up to me after a training session and enquired if there was anything else I thought he should be doing. That might seem a natural enough thing but I can't ever remember it happening before or after with another player. And for a fella at that age to display that sort of initiative and maturity, it showed how aware he was of his limitations then and how determined he was to improve. Dean was dropped in 2012. Pat Gilroy probably thought he wasn't quick enough to play inter-county football at the very top level but has subsequently proven plenty of people wrong. Jim Gavin is a manager who is always looking down the line and I think after 2014, he wanted a free-taker who he could rely on to score 90 to 95 per cent of kicks from within the 45-metre range. That's part of the reason he has played some part in every game since then but obviously, Jim wasn't going to pick him unless his return warranted it. Over the past three and a half years, Dean has been the free-taker with the highest percentages in the country and the man who has executed the most high-pressure kicks. Dublin have won the last two All-Irelands by a single point. Dean's return in those two games is 0-16, 0-6 from play. He's also become a scorer of important goals and has made an enormous improvement in his tackling in that time. So has O'Connor, although he plays closer to the edge. O'Connor knows he's a target and he knows how to handle himself and occasionally, has stepped over the line. That doesn't endear him to people from outside Mayo and because of that, they often look for ways to demean his achievements or attach mitigation. For some, he's either a 'flat-track bully' or has benefited from Mayo's long and winding roads to Croke Park, playing extra matches against back door teams. The stats make a lie of that. He is 22 points off Gooch's all-time record, yet he's played 37 fewer Championship matches. He had an almost identical scoring tally to the great Mikey Sheehy when he equalled his number of appearances and his scoring per game average is currently higher than Maurice Fitzgerald's. He's scored three Championship hat-tricks, too - one of them against Jim McGuiness's Donegal. Maybe he needs to ice the winner in an All-Ireland final before people give O'Connor his just credit. Those two he missed into Hill 16 were vital, highly-pressurised kicks, very similar to the one Dean nailed last year, at the other end, with a GPS flying through the air at him. But it's wrong for people to ignore the scale and quality of O'Connor's work and focus instead on the couple he didn't make. O'Connor has earned his place among the most prolific forwards of all time, even if he probably has to win an All-Ireland SFC before his gets the credit he deserves.